As a majority state-owned airline in North Africa, Tunisair has retained most of the flag carrier privileges that are cemented in the 1944 Chicago Convention, but those protectionist practices run counter to the present realities of passengers wanting choice and low fares. It is only natural that Tunisair defends its flag carrier status and historic market share, yet its lax attitude to take out legacy waste makes it ill-prepared for an Open Skies with the European Union or other Maghreb countries. Tunisair deploys about 70% of its weekly seat capacity on routes to Western Europe and it has a 55% to 68% share of all one-way seats flown between Tunisia and Western Europe depending the high or low season. This is likely to decrease under an Open Skies with the EU and this in turn could lead to a further erosion of Tunisair’s financial results. Talks between EU officials and the Tunisian Government on a comprehensive air services transport agreement were formally initiated by the European Commission at the end of 2008 but did not advance. 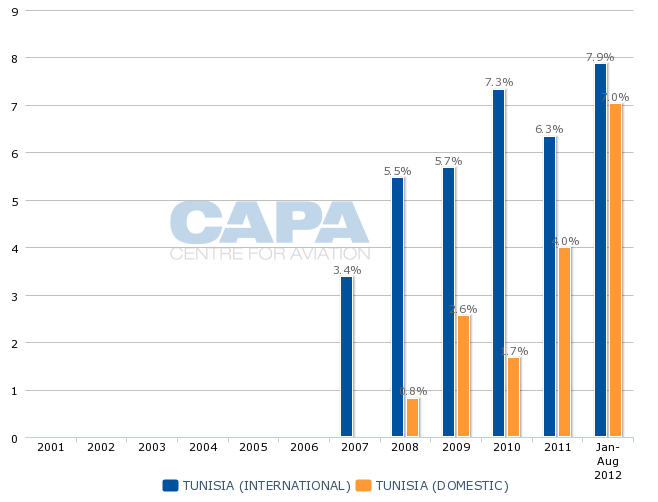 Contributing to the failure of both sides making progress was the lack of a clear position by Tunisia on whether to support the interests of its home-based airlines, specifically Tunisair, or back demands of the tourism industry and open its skies to a free flow of LCCs from Europe. The 2011 social unrest halted negotiations but the country’s newly elected government has put the matter back on the agenda. Tourism represented nearly 7% of the country’s GDP and accounted for 450,000 jobs in 2010, according to the UNWTO. The political instability engulfing Tunisia in 2011 had extensive implications for tourism and aviation in the country, with tourism receipts decreasing by 33% from 2010. Total passenger throughput at the country’s airports fell 27% to 8.2 million in 2011, and aircraft movements recorded a 20% drop compared to the prior year. Tunisia’s Government needs to restore and shore up the country’s economy. The economic benefits from air transport are well documented and the liberalisation of the sector will facilitate flows of tourists, trade and investment, and thus create the much needed jobs and boost GDP. The EU is Tunisia's first trading partner and accounted for 67% of Tunisian imports and 74% of Tunisian exports in 2010. An Open Skies with the country fits within the EU’s ambition to stretch out the Common Aviation Area (CAA) or Open Aviation Area to include its neighbouring countries as well as a number of countries in the Mediterranean region with strong economic, cultural and historical links with the community. Similar comprehensive air transport agreements with EU neighbouring countries have been concluded with western Balkan countries, Morocco, Georgia, Jordan, Israel and Moldova. The latter was signed on 26-Jun-2012. According to the European Commission, negotiations are ongoing not only with Tunisia but also with the Ukraine and Lebanon. The European Commission likes to point out that based on the experience of similar agreements signed with other EU neighbouring countries, the gradual opening of the market typically results in increased connectivity with a larger number of direct flights to more destinations at lower prices. The Open Skies agreement with Morocco, which was signed in Dec-2006, indeed resulted in a sharp increase in LCC traffic between the EU and the country although the exponential growth rate levelled off in 2011 as a result of the effects of the Arab Spring as well as the euro zone debt crisis. Europe’s LCCs are now overwhelmingly present in the EU to Morocco market, and Ryanair is Morocco’s second largest airline in terms of scheduled seat capacity. The portion of capacity that LCCs account for in Morocco has more than tripled from about 12% in 2006 to 40% in 2011, according to OAG data. Morocco and Tunisia are comparable markets. Both countries are a major European tourist destination and tourism is a key sector of the countries’ economies. They have a significant amount of ethnic travel to/from western Europe and the majority of their international capacity in terms of seats is deployed on routes to/from western Europe. If an EU-Tunisia Open Skies accord materialises, LCC traffic will develop and Europe’s no-frills operators will swiftly take a leading role as the segment is underdeveloped in Tunisia. 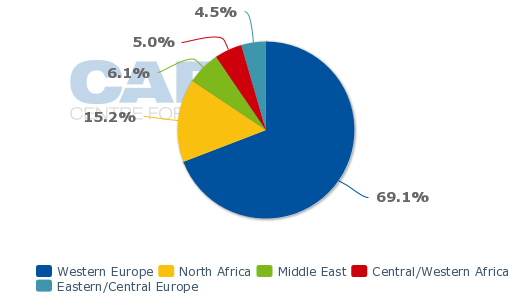 LCCs presently have a mere 8% share of international scheduled seat capacity flown to/from Tunisia. 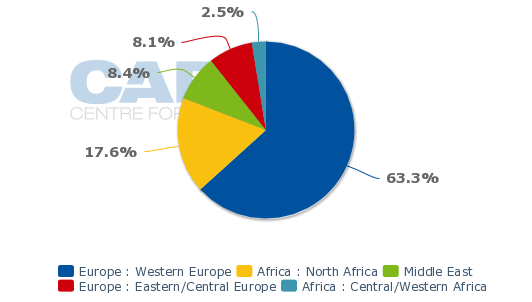 The aviation market of Africa’s smallest and northernmost country is predominantly international with less than 3% of seat capacity (or about 5000 seats per week) flown on domestic routes, based on schedules in Innovata for the week of 20-Aug-2012 to 26-Aug-2012. Western Europe is the most important market for Tunisia, accounting for 63% of scheduled international seats to/from the country. When adding the capacity that is deployed to/from Central and Eastern Europe, Europe represents approximately 71% of Tunisia's weekly seats. North Africa is the country’s second largest market with about an 18% share. More than half of the capacity in terms of weekly seats in this region is deployed on routes to/from neighbour Libya, which is a major trading partner. Tunisair is the largest operator in Tunisia with an approximate 52% share of scheduled seat capacity when factoring in the capacity produced by its fully owned regional subsidiary Tunisair express, based on schedules in Innovata for the week of 20-Aug-2012 to 26-Aug-2012. 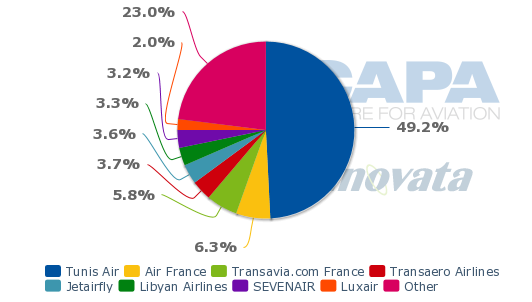 The remaining capacity is very fragmented though Air France and Air France-KLM Group’s French LCC charter subsidiary Transavia.com France jointly have a 12% capacity share. Tunisair express operated as Tuninter from 1991 to 2007 and as Sevenair untll Jan-2011, when its current name was adopted. It operates a fleet of three 70-seat ATR 72 turboprops and one 88-seat Bombardier CRJ900, according to the company’s website. Tunisair group’s share of scheduled seat production gradually rises as the low season sets in and amounts to 65% in the week of 10-Dec-2012 to 16-Dec-2012 when Europe’s leisure carriers reduce their number of seats on offer to the country. But Western Europe still accounts for the bulk of Tunisia’s international winter capacity, with a 61% share of all scheduled seats deployed on routes to/from the country. As the national carrier of Tunisia, Tunisair’s traffic flows reflect the demand patterns of the country and it deploys about 69% of its weekly scheduled seat capacity to Western Europe where it serves all the main capital airports such as Amsterdam, Brussels, Rome Fiumicino, London Heathrow, Lisbon, Madrid Barajas and Vienna. In certain capital cities it flies to the secondary airport, including Paris Orly and Berlin Schoenefeld. Its network comprises 54 non-stop scheduled passenger destinations, including five domestic airports, 10 gateways in Africa and 34 markets in Europe. Its main base is at Tunis Carthage Airport with a secondary base at Djerba Zarzis Airport. Alongside its scheduled operations, Tunisair operates an extensive charter network that represents up to 50% of its total capacity in the peak holiday season. France is Tunisair’s main market. The airline flies some 36,000 seats to/from the hexagon per week (equivalent to about 56% of its western European scheduled capacity or 37% of its total international scheduled seat capacity), as per the GDS inventory displays loaded in Innovata for the week of 20-Aug-2012 to 26-Aug-2012. It serves nine airports in France: Bordeaux, Lille Lesquin, Lyon Saint-Exupery, Marseille, Nantes Atlantique, Nice, Paris Orly, Strasbourg and Toulouse. The importance of France in Tunisair’s market is historic. Tunisia is a former French protectorate and achieved independence from France in 1956. Air France helped establish Société Tunisienne de l'Air in 1948. In 1999 Tunisair expressed its desire to become a member or affiliate member of the Air France-KLM led SkyTeam alliance, but it dropped the objective over differences on prerequisites for such membership and disagreements on serving Paris. Paris is Tunisair’s main destination. Two of Tunisair’s 10 largest international scheduled routes are operated to Paris Orly, which is its second largest station (after Tunis Airport) with some 15,300 seats per week, according to schedules in Innovata for the week of 20-Aug-2012 to 26-Aug-2012. The airline’s main competitor on its routes to Paris is Air France-KLM Group. Air France operates from Paris Charles de Gaulle to Tunis Carthage Airport and Transavia.com France flies from Paris Orly, and jointly they have a 47% share of weekly scheduled seat capacity on the city pair. 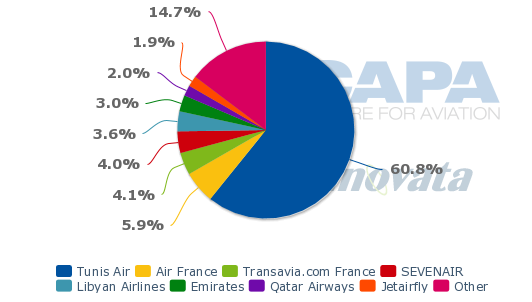 Tunisair has a 48% capacity share on Tunis-Paris whereas Aigle Azur has about a 6% capacity share. Tunisair and Transavia.com France also compete on the Djerba Zarsis-Paris Orly route with Aigle Azur operating one weekly flight on the route. Tunisair and Air France also compete head-to-head on routes from Tunis to Marseille, Nice, Lyon and Toulouse, with Tunisair offering the majority of seat capacity on these routes. Tunisair is the sole operator from Tunis to Lille, Bordeaux and Nantes. Tunisair and Air France used to codeshare on several services between France and Tunisia, but Air France ended the agreement on 04-Jan-2010. Tunisair has a market leading position in most of its main markets. It has a near 60% share of scheduled seats flown from Tunisia to France, an approximate 48% seat capacity share on routes between Tunisia and Libya when factoring in the capacity flown by Tunisair express and a 62% capacity share on routes to Italy when including its regional carrier capacity. It also is the leading capacity provider on routes to Saudi Arabia (ca. 63% of scheduled seat capacity), to the UK (60%) and Switzerland (81%). Conversely, Jetairfly is now clearly the dominant scheduled operator on routes between Tunisia and Belgium, with an 82% share of seat capacity compared to a 28% share for Tunisair. Tunisair faces very limited competition on scheduled services from home-based carriers. Privately-held Nouvelair is mainly a charter carrier with strong links to tour operators, but it is starting to reposition itself as a LCC. Its history goes back to Oct-1989 when it was created as a subsidiary of the French carrier Air Liberté operating two leased MD83 aircraft. In 1995, Tunisian Travel Service Group became the majority shareholder in the airline and in 2005 it changed its name from Air Liberté Tunisie to Nouvelair. The airline’s fleet is made up of 14 aircraft: 12 A320s with 177-180 seats and two A321s configured with 215 seats. 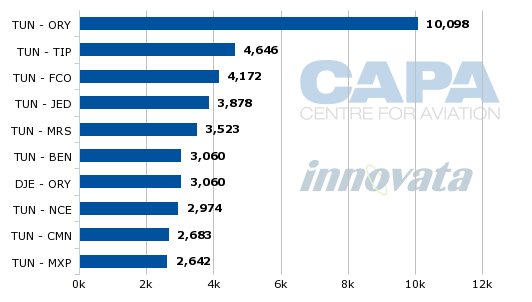 Its network spans 34 destinations in Europe, according to Innovata. Tunisia’s Conseil National de l'Aviation Civile in Sep-2011 reportedly authorised the creation of two new airlines, Syphax Airlines and Free Jet. Free Jet initially planned to launch in Apr-2012, offering both charter and low-cost services from Tunis Carthage Airport initially with two CFM56-B5 powered A320s configured with 180 seats. But Free Jet has not yet taken to the skies. Syphax Airlines started operations on 14-Apr-2012 from its base at Sfax Thyna Airport to several airports in Europe, but had to suspend operations soon after due to a dispute with Tunisair. Fround handling staff at Tunisair refused to complete check-ins or baggage handling for the carrier when it launched operation to Tunis Carthage Airport, the base of Tunisair. A consensus was found a week later and the country’s National Council for Civil Aviation stated on 21-Apr-2012 that following a meeting “chaired by the Minister of Transport, Abdelkarim Harouni and in the presence of CEO of Tunisian Civil Aviation and Airports Authority, Tunisair group and Syphax Airlines, the private carrier Syphax Airlines was allowed to operate from all Tunisian airports”. Syphax Airlines relaunched on 04-May-2012 and now operates two A319s, which are leased from Doric Asset Management. Its current network includes twice weekly Djerba-Paris service, three times weekly Sfax-Tripoli service, twice weekly Sfax-Marseille service, five times weekly Sfax-Paris CDG service and three times weekly Tunis-Paris CDG service. Reportedly, the hybrid airline is allowed to operate only three weekly flights from Tunis Cartage to Paris, but it has no capacity restrictions on operations from Sfax or Djerba. Tunisair embraced a new strategy in 2001 and created separate entities for its handling activities (Tunisair Handling), its catering (Tunisie Catering) and its MRO business (Tunisair Technics). It restructured its regional operations under Tunisair express and in 2008 placed orders for the acquisition of three A350-800s, three A330-200s and 10 A320s as part of a comprehensive development plan to modernise and expand the fleet. The third new A320 of this order was delivered on 16-Jul-2012. The A330s and later on the A350 will allow Tunisair to develop its long-haul markets. The carrier had planned to take delivery of its first A330s at the end of 2011 to launch services to the US and Canada, but the political turmoil in the country and the region put those plans on hold. Long-haul routes in Africa and China are options being considered by the airline’s new management. Tunisia has low labour costs and a highly skilled work force, but legacy and government interference have stalled efforts to streamline the airline. If Tunisair wants to compete with the expected inflow of Europe’s LCCs under the anticipated Open Skies with Europe, it must speed up its turnaround and adapt a more dynamic approach to the ongoing market changes.